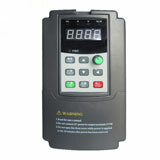 Applying a frequency inverter to a specific application is no mystery when you understand the requirements of the load. Simply put, the frequency inverter must have ample current capability for the motor so that the motor can produce the required torque for the load. You must remember that machine torque is independent of motor speed and that load horsepower increases linearly with rpm. Frequency inverter applications can be divided into the following individual load types. Constant torque loads: These loads represent 90% of all general industrial machines (other than pumps and fans). Examples of these load types include general machinery, hoists, conveyors, printing presses, positive displacement pumps, some mixers and extruders, reciprocating compressors, as well as rotary compressors. Constant horsepower loads: These loads are most often found in the machine-tool industry and center driven winder applications. Examples of constant horsepower loads include winders, core-driven reels, wheel grinders, large driller machines, lathes, planers, boring machines, and core extruders. Traditionally, these loads were considered DC drive applications only. With high-performance flux vector frequency inverter's now available, many DC drive applications of this type can be now handled by frequency inverters. Variable torque loads: Variable torque loads are most often found in variable flow applications, such as fans and pumps. Examples of applications include fans, centrifugal blowers, centrifugal pumps, propeller pumps, turbine pumps, agitators, and axial compressors. Frequency inverters offer the greatest opportunity for energy savings when driving these loads because horsepower varies as the cube of speed and torque varies as square of speed for these loads. For example, if the motor speed is reduced 20%, motor horsepower is reduced by a cubic relationship (.8 X .8 X .8), or 51%. 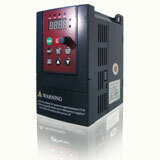 As such, utilities often offer subsidies to customers investing in frequency inverter technology for their applications. Many frequency inverter manufactures have free software programs available for customers to calculate and document potential energy savings by using frequency inverters.